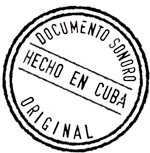 Vocal Sampling recorded its lastest CD, "Así de Sampling"written by René Baños, director of the group, but also of other renowned artists of Cuban music and elsewhere. "On this album made a tribute to our grandparents" says René Baños, on the occasion of the themes of the Buena Vista Social Club including this latest album. It also includes topics of Cuban singer Tony Avila. Vocal Sampling is also working in a sui generis disc, it will be the first recorded several CDs dedicated to a specific topic. They are now focused on performing one dedicated to music concert, where they include classics of the genre, but also some arrangements René own.